a Although holding the position until 17 April 1942, the executive power was exercised by the Deputy Prime Ministers from 11 July 1940. Henri Philippe Benoni Omer Joseph Pétain (24 April 1856 – 23 July 1951), generally known as Philippe Pétain (French: [fi.lip pe.tɛ̃]), Marshal Pétain (Maréchal Pétain) and The Old Marshal (Le Vieux Maréchal), was a French general officer who attained the position of Marshal of France at the end of World War I, during which he became known as The Lion of Verdun, and in World War II served as the Chief of State of Vichy France from 1940 to 1944. Pétain, who was 84 years old in 1940, ranks as France's oldest head of state. During World War I Pétain led the French Army to victory at the nine-month-long Battle of Verdun. 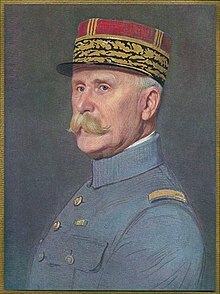 After the failed Nivelle Offensive and subsequent mutinies he was appointed Commander-in-Chief and succeeded in repairing the army's confidence. Pétain remained in command throughout the war and emerged as a national hero. During the interwar period he was head of the peacetime French Army, commanded joint Franco-Spanish operations during the Rif War and served twice as a government Minister. With the imminent Fall of France in June 1940 in World War II, Pétain was appointed President of the Ministerial Council by President Lebrun at Bordeaux, and the Cabinet resolved to sign an armistice agreement with Germany. The entire government subsequently moved briefly to Clermont-Ferrand, then to the spa town of Vichy in central France. His government voted to transform the discredited French Third Republic into the French State, an authoritarian regime that collaborated with the Nazis and the Axis Powers. After the war, Pétain was tried and convicted for treason. He was originally sentenced to death, but due to his age and World War I service his sentence was commuted to life in prison and he died in 1951. Pétain was born in Cauchy-à-la-Tour (in the Pas-de-Calais département in Northern France) in 1856. His father, Omer-Venant, was a farmer. His great-uncle, a Catholic priest, Father Abbe Lefebvre, had served in Napoleon's Grande Armée and told the young Pétain tales of war and adventure of his campaigns from the peninsulas of Italy to the Alps in Switzerland. Highly impressed by the tales told by his uncle, his destiny was from then on determined. Pétain was a bachelor until his sixties, and known for his womanising. Women were said to find his piercing blue eyes especially attractive. After World War I Pétain married his former girlfriend, Eugénie Hardon (1877–1962), "a particularly beautiful woman", on 14 September 1920; they remained married until the end of Pétain's life. After rejecting Pétain's first marriage proposal, Hardon had married and divorced François de Hérain by 1914 when she was 35. At the opening of the Battle of Verdun in 1916, Pétain is said to have been fetched during the night from a Paris hotel by a staff officer who knew that he could be found with Eugénie Hardon. She had no children by Pétain but already had a son from her first marriage, Pierre de Hérain, whom Pétain strongly disliked. Pétain's career progressed slowly, as he rejected the French Army philosophy of the furious infantry assault, arguing instead that "firepower kills". His views were later proved to be correct during the First World War. He was promoted to captain in 1890 and major (Chef de Bataillon) in 1900. Unlike many French officers, he served mainly in mainland France, never French Indochina or any of the African colonies, although he participated in the Rif campaign in Morocco. As colonel, he commanded the 33rd Infantry Regiment at Arras from 1911; the young lieutenant Charles de Gaulle, who served under him, later wrote that his "first colonel, Pétain, taught (him) the Art of Command". In the spring of 1914, he was given command of a brigade (still with the rank of colonel). However, aged 58 and having been told he would never become a general, Pétain had bought a villa for retirement. Pétain led his brigade at the Battle of Guise (29 August 1914). At the end of August 1914 he was quickly promoted to brigadier-general and given command of the 6th Division in time for the First Battle of the Marne; little over a month later, in October 1914, he was promoted yet again and became XXXIII Corps commander. After leading his corps in the spring 1915 Artois Offensive, in July 1915 he was given command of the Second Army, which he led in the Champagne Offensive that autumn. He acquired a reputation as one of the more successful commanders on the Western Front. Pétain commanded the Second Army at the start of the Battle of Verdun in February 1916. During the battle, he was promoted to Commander of Army Group Centre, which contained a total of 52 divisions. Rather than holding down the same infantry divisions on the Verdun battlefield for months, akin to the German system, he rotated them out after only two weeks on the front lines. His decision to organise truck transport over the "Voie Sacrée" to bring a continuous stream of artillery, ammunition and fresh troops into besieged Verdun also played a key role in grinding down the German onslaught to a final halt in July 1916. In effect, he applied the basic principle that was a mainstay of his teachings at the École de Guerre (War College) before World War I: "le feu tue!" or "firepower kills! "—in this case meaning French field artillery, which fired over 15 million shells on the Germans during the first five months of the battle. Although Pétain did say "On les aura!" (an echoing of Joan of Arc, roughly: "We'll get them! "), the other famous quotation often attributed to him – "Ils ne passeront pas!" ("They shall not pass"!) – was actually uttered by Robert Nivelle who succeeded him in command of the Second Army at Verdun in May 1916. At the very end of 1916, Nivelle was promoted over Pétain to replace Joseph Joffre as French Commander-in-Chief. The immediate cause was the extreme optimism and subsequent disappointment at the Nivelle offensive in the spring of 1917. Other causes were pacificism, stimulated by the Russian Revolution and the trade-union movement, and disappointment at the nonarrival of American troops. The year 1918 saw major German offensives on the Western Front. The first of these, Operation Michael in March 1918, threatened to split the British and French forces apart, and, after Pétain had threatened to retreat on Paris, the Doullens Conference was called. Just prior to the main meeting, Prime Minister Clemenceau claimed he heard Pétain say "les Allemands battront les Anglais en rase campagne, après quoi ils nous battront aussi" ("the Germans will beat the English (sic) in open country, then they'll beat us as well"). He reported this conversation to President Poincaré, adding "surely a general should not speak or think like that?" Haig recorded that Pétain had "a terrible look. He had the appearance of a commander who had lost his nerve". Pétain believed – wrongly – that Gough's Fifth Army had been routed like the Italians at Caporetto. At the Conference, Ferdinand Foch was appointed as Allied Generalissimo, initially with powers to co-ordinate and deploy Allied reserves where he saw fit. Pétain eventually came to the aid of the British and secured the front with forty French divisions. Pétain proved a capable opponent of the Germans both in defence and through counter-attack. The third offensive, "Blücher", in May 1918, saw major German advances on the Aisne, as the French Army commander (Humbert) ignored Pétain's instructions to defend in depth and instead allowed his men to be hit by the initial massive German bombardment. By the time of the last German offensives, Gneisenau and the Second Battle of the Marne, Pétain was able to defend in depth and launch counter offensives, with the new French tanks and the assistance of the Americans. 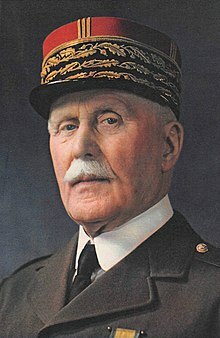 Later in the year, Pétain was stripped of his right of direct appeal to the French government and requested to report to Foch, who increasingly assumed the co-ordination and ultimately the command of the Allied offensives. After the war ended Pétain was made Marshal of France on 21 November 1918. Pétain ended the war regarded "without a doubt, the most accomplished defensive tactician of any army" and "one of France's greatest military heroes" and was presented with his baton of Marshal of France at a public ceremony at Metz by President Raymond Poincaré on 8 December 1918. He was summoned to be present at the signing of the Treaty of Versailles on 28 June 1919. His job as Commander-in-Chief came to an end with peace and demobilisation, and with Foch out of favour after his quarrel with the French government over the peace terms, it was Petain who, in January 1920, was appointed Vice-Chairman of the revived Conseil supérieur de la Guerre (Supreme War Council). This was France's highest military position, whose holder was Commander-in-Chief designate in the event of war and who had the right to overrule the Chief of the General Staff (a position held in the 1920s by Petain's protégés Buat and Debeney), and Petain would hold it until 1931. Pétain was encouraged by friends to go into politics, although he protested that he had little interest in running for an elected position. He nevertheless tried and failed to get himself elected President following the November 1919 elections. 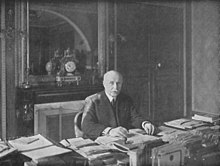 Shortly after the war, Pétain had placed before the government plans for a large tank and air force but "at the meeting of the Conseil supérieur de la Défense Nationale of 12 March 1920 the Finance Minister, François-Marsal, announced that although Pétain's proposals were excellent they were unaffordable". In addition, François-Marsal announced reductions – in the army from fifty-five divisions to thirty, in the air force, and did not mention tanks. It was left to the Marshals, Pétain, Joffre, and Foch, to pick up the pieces of their strategies. The General Staff, now under General Edmond Buat, began to think seriously about a line of forts along the frontier with Germany, and their report was tabled on 22 May 1922. The three Marshals supported this. The cuts in military expenditure meant that taking the offensive was now impossible and a defensive strategy was all they could have. Pétain was appointed Inspector-General of the Army in February 1922 and produced, in concert with the new Chief of the General Staff, General Marie-Eugène Debeney, the new army manual entitled Provisional Instruction on the Tactical Employment of Large Units, which soon became known as 'the Bible'. On 3 September 1925 Pétain was appointed sole Commander-in-Chief of French Forces in Morocco to launch a major campaign against the Rif tribes, in concert with the Spanish Army, which was successfully concluded by the end of October. He was subsequently decorated, at Toledo, by King Alfonso XIII with the Spanish Medalla Militar. In 1924 the National Assembly was elected on a platform of reducing the length of national service to one year, to which Pétain was almost violently opposed. In January 1926 the Chief of Staff, General Debeney, proposed to the Conseil a "totally new kind of army. Only 20 infantry divisions would be maintained on a standing basis". Reserves could be called up when needed. The Conseil had no option in the straitened circumstances but to agree. Pétain, of course, disapproved of the whole thing, pointing out that North Africa still had to be defended and in itself required a substantial standing army. But he recognised, after the new Army Organisation Law of 1927, that the tide was flowing against him. He would not forget that the Radical leader, Édouard Daladier, even voted against the whole package, on the grounds that the Army was still too large. On 5 December 1925, after the Locarno Treaty, the Conseil demanded immediate action on a line of fortifications along the eastern frontier to counter the already proposed decline in manpower. A new commission for this purpose was established, under Joseph Joffre, and called for reports. In July 1927 Pétain himself went to reconnoitre the whole area. He returned with a revised plan and the commission then proposed two fortified regions. The Maginot Line, as it came to be called, (named after André Maginot the former Minister of War) thereafter occupied a good deal of Pétain's attention during 1928, when he also travelled extensively, visiting military installations up and down the country. Pétain had based his strong support for the Maginot Line on his own experience of the role played by the forts during the Battle of Verdun in 1916. Captain Charles de Gaulle continued to be a protégé of Pétain throughout these years. He even named his eldest son after the Marshal before finally falling out over the authorship of a book he had said he had ghost-written for Pétain. In 1928 Pétain had supported the creation of an independent air force removed from the control of the army, and on 9 February 1931, following his retirement as Vice-Chairman of the Supreme War Council, he was appointed Inspector-General of Air Defence. His first report on air defence, submitted in July that year, advocated increased expenditure. In 1931 Pétain was elected a Fellow of the Académie française. By 1932 the economic situation had worsened and Édouard Herriot's government had made "severe cuts in the defence budget... orders for new weapons systems all but dried up". Summer maneuvers in 1932 and 1933 were cancelled due to lack of funds, and recruitment to the armed forces fell off. In the latter year General Maxime Weygand claimed that "the French Army was no longer a serious fighting force". Édouard Daladier's new government retaliated against Weygand by reducing the number of officers and cutting military pensions and pay, arguing that such measures, apart from financial stringency, were in the spirit of the Geneva Disarmament Conference. In 1938 Pétain encouraged and assisted the writer André Maurois in gaining election to the Académie française – an election which was highly contested, in part due to Maurois' Jewish origin. Maurois made a point of acknowledging with thanks his debt to Pétain in his 1941 autobiography, Call no man happy – though by the time of writing their paths had sharply diverged, Pétain having become Head of State of Vichy France while Maurois went into exile and sided with the Free French. Political unease was sweeping the country, and on 6 February 1934 the Paris police fired on a group of far-right rioters outside the Chamber of Deputies, killing 14 and wounding a further 236. President Lebrun invited 71-year-old Doumergue to come out of retirement and form a new "government of national unity". Pétain was invited, on 8 February, to join the new French cabinet as Minister of War, which he only reluctantly accepted after many representations. His important success that year was in getting Daladier's previous proposal to reduce the number of officers repealed. He improved the recruitment programme for specialists, and lengthened the training period by reducing leave entitlements. However Weygand reported to the Senate Army Commission that year that the French Army could still not resist a German attack. Marshals Louis Franchet d'Espèrey and Hubert Lyautey (the latter suddenly died in July) added their names to the report. After the autumn maneuvers, which Pétain had reinstated, a report was presented to Pétain that officers had been poorly instructed, had little basic knowledge, and no confidence. He was told, in addition, by Maurice Gamelin, that if the plebiscite in the Territory of the Saar Basin went for Germany it would be a serious military error for the French Army to intervene. Pétain responded by again petitioning the government for further funds for the army. During this period, he repeatedly called for a lengthening of the term of compulsory military service for conscripts from two to three years, to no avail. Pétain accompanied President Lebrun to Belgrade for the funeral of King Alexander, who had been assassinated on 6 October 1934 in Marseille by Vlado Chernozemski, a Macedonian nationalist of Bulgarian origin. Here he met Hermann Göring and the two men reminisced about their experiences in the Great War. "When Goering returned to Germany he spoke admiringly of Pétain, describing him as a 'man of honour'". In November the Doumergue government fell. Pétain had previously expressed interest in being named Minister of Education (as well as of War), a role in which he hoped to combat what he saw as the decay in French moral values. Now, however, he refused to continue in Flandin's (short-lived) government as Minister of War and stood down – in spite of a direct appeal from Lebrun himself. At this moment an article appeared in the popular Le Petit Journal newspaper, calling for Pétain as a candidate for a dictatorship. 200,000 readers responded to the paper's poll. Pétain came first, with 47,000, ahead of Pierre Laval's 31,000 votes. These two men travelled to Warsaw for the funeral of the Polish Marshal Pilsudski in May 1935 (and another cordial meeting with Goering). Although Le Petit Journal was conservative, Pétain's high reputation was bipartisan; socialist Léon Blum called him "the most human of our military commanders". Pétain did not get involved in non-military issues when in the Cabinet, and unlike other military leaders he did not have a reputation as an extreme Catholic or a monarchist. He remained on the Conseil superieur. Weygand had been at the British Army 1934 manoeuvres at Tidworth Camp in June and was appalled by what he had seen. Addressing the Conseil on the 23rd, Pétain claimed that it would be fruitless to look for assistance to Britain in the event of a German attack. On 1 March 1935 Pétain's famous article appeared in the Revue des deux mondes where he reviewed the history of the army since 1927–28. He criticised the reservist system in France, and her lack of adequate air power and armour. This article appeared just five days before Adolf Hitler's announcement of Germany's new air force and a week before the announcement that Germany was increasing its army to 36 divisions. On 26 April 1936 the general election results showed 5.5 million votes for the Popular Front parties against 4.5 million for the Right on an 84% turnout. On 3 May Pétain was interviewed in Le Journal where he launched an attack on the Franco-Soviet Pact, on Communism in general (France had the largest communist party in Western Europe), and on those who allowed Communists intellectual responsibility. He said that France had lost faith in her destiny. Pétain was now in his 80th year. Some argue that Pétain, as France's most senior soldier after Foch's death, should bear some responsibility for the poor state of French weaponry preparation before World War II. But Pétain was only one of many military and other men on a very large committee responsible for national defence, and interwar governments frequently cut military budgets. In addition, with the restrictions imposed on Germany by the Versailles Treaty there seemed no urgency for vast expenditure until the advent of Hitler. It is argued that while Pétain supported the massive use of tanks he saw them mostly as infantry support, leading to the fragmentation of the French tank force into many types of unequal value spread out between mechanised cavalry (such as the SOMUA S35) and infantry support (mostly the Renault R35 tanks and the Char B1 bis). Modern infantry rifles and machine guns were not manufactured, with the sole exception of a light machine-rifle, the Mle 1924. The French heavy machine gun was still the Hotchkiss M1914, a capable weapon but decidedly obsolete compared to the new automatic weapons of German infantry. A modern infantry rifle was adopted in 1936 but very few of these MAS-36 rifles had been issued to the troops by 1940. A well-tested French semiautomatic rifle, the MAS 1938–39, was ready for adoption but it never reached the production stage until after World War II as the MAS 49. As to French artillery it had, basically, not been modernised since 1918. The result of all these failings is that the French Army had to face the invading enemy in 1940, with the dated weaponry of 1918. Pétain had been made, briefly, Minister of War in 1934. Yet his short period of total responsibility could not reverse 15 years of inactivity and constant cutbacks. The War Ministry was hamstrung between the wars and proved unequal to the tasks before them. French aviation entered the War in 1939 without even the prototype of a bomber aeroplane capable of reaching Berlin and coming back. French industrial efforts in fighter aircraft were dispersed among several firms (Dewoitine, Morane-Saulnier and Marcel Bloch), each with its own models. On the naval front, France had purposely overlooked building modern aircraft carriers and focused instead on four new conventional battleships, not unlike the German Navy. In March 1939 Pétain became the French ambassador to Spain. According to a New York Times article, Pétain had taught the Spanish dictator Francisco Franco "many years ago at France's war college" and was sent to Spain "in the hope he would win his former pupil away from Italian and German influence." When World War II began in September, Pétain turned down Daladier's offer of a position in his government. However on 18 May 1940, after Germany invaded France; Pétain joined the new government of Paul Reynaud. Reynaud hoped that the hero of Verdun might instill a renewed spirit of resistance and patriotism in the French Army. Reportedly Francisco Franco advised Pétain against leaving his diplomatic post in Madrid, to return to a collapsing France as a "sacrifice". On 24 May, the invading Germans pushed back the French Army. General Maxime Weygand expressed his fury at British retreats and the unfulfilled promise of British fighter aircraft. He and Pétain regarded the military situation as hopeless. Reynaud subsequently stated before a parliamentary commission of inquiry in December 1940 that he said, as Premier of France to Pétain on that day that they must seek an armistice. Weygand said that he was in favour of saving the French army and that he "wished to avoid internal troubles and above all anarchy". Churchill's man in Paris, Edward Spears, kept up pressure on the French not to sign an armistice as this would result in the necessity for Britain to bomb French ports if occupied by Germany. Spears reported that Pétain did not respond immediately but stood there "perfectly erect, with no sign of panic or emotion. He did not disguise the fact that he considered the situation catastrophic. I could not detect any sign in him of broken morale, of that mental wringing of hands and incipient hysteria noticeable in others". Pétain later remarked to Reynaud about this threat, saying "your ally now threatens us". On 5 June, following the fall of Dunkirk, there was a Cabinet reshuffle, and Prime Minister Reynaud brought the newly promoted Brigadier-General de Gaulle, whose 4th Armoured Division had launched one of the few French counterattacks the previous month, into his War Cabinet. Pétain was displeased at de Gaulle’s appointment. On 8 June, Paul Baudouin dined with Chautemps, and both declared that the war must end. Paris was now threatened, and the government was preparing to depart, although Pétain was opposed to such a move. During a cabinet meeting that day, Reynaud argued that before asking for an armistice, France would have to get Britain's permission to be relieved from their accord of March 1940 not to sign a separate cease fire. Pétain replied that "the interests of France come before those of Britain. Britain got us into this position, let us now try to get out of it"..
On 10 June, the government left Paris for Tours. Weygand, the Commander-in-Chief, now declared that "the fighting had become meaningless". He, Baudouin, and several members of the government were already set on an armistice. On 11 June, Churchill flew to the Château du Muguet, at Briare, near Orléans, where he put forward first his idea of a Breton redoubt, to which Weygand replied that it was just a "fantasy". Churchill then said the French should consider "guerrilla warfare". Pétain then replied that it would mean the destruction of the country. Churchill then said the French should defend Paris and reminded Petain of how he had come to the aid of the British with forty divisions in March 1918, and repeating Clemenceau's words "I will fight in front of Paris, in Paris, and behind Paris". To this, Churchill subsequently reported, Pétain replied quietly and with dignity that he had in those days a strategic reserve of sixty divisions; now, there were none, and the British ought to be providing divisions to aid France. Making Paris into a ruin would not affect the final event. At the conference Pétain met de Gaulle for the first time in two years. Pétain noted his recent promotion to general, adding that he did not congratulate him, as ranks were of no use in defeat. When de Gaulle protested that Pétain himself had been promoted to brigadier-general and division commander at the Battle of the Marne in 1914, he replied that there was "no comparison" with the present situation. De Gaulle later conceded that Pétain was right about that much at least. On 12 June, after a second session of the conference, the cabinet met and Weygand again called for an armistice. He referred to the danger of military and civil disorder and the possibility of a Communist uprising in Paris. Pétain and Minister of Information Prouvost urged the cabinet to hear Weygand out because "he was the only one really to know what was happening". Churchill returned to France on the 13th for another conference at Tours. Paul Baudouin met his plane and immediately spoke to him of the hopelessness of further French resistance. Reynaud then put the cabinet's armistice proposals to Churchill, who replied that "whatever happened, we would level no reproaches against France". At that day's cabinet meeting, Pétain strongly supported Weygand’s demand for an armistice and read out a draft proposal to the cabinet where he spoke of "the need to stay in France, to prepare a national revival, and to share the sufferings of our people. It is impossible for the government to abandon French soil without emigrating, without deserting. The duty of the government is, come what may, to remain in the country, or it could not longer be regarded as the government". Several ministers were still opposed to an armistice, and Weygand immediately lashed out at them for even leaving Paris. Like Pétain, he said he would never leave France. Parliament, both senate and chamber, were also at Bordeaux and immersed themselves in the armistice debate. 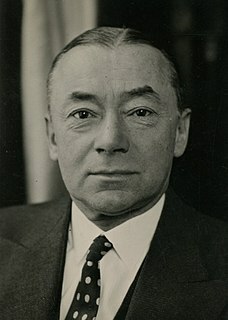 At cabinet on 15 June Reynaud urged that France follow the Dutch example, that the Army should lay down its arms so that the fight could be continued from abroad. Pétain was sympathetic. Pétain was sent to speak to Weygand (who was waiting outside, as he was not a member of the cabinet) for around fifteen minutes. Weygand persuaded him that Reynaud's suggestion would be a shameful surrender. Chautemps then proposed a fudge proposal, an inquiry about terms. The Cabinet voted 13-6 for the Chautemps proposal. Admiral Darlan, who had been opposed to an armistice until 15 June, now became a key player, agreeing provided the French fleet was kept out of German hands. On Sunday 16 June President Roosevelt's reply to President Lebrun's requests for assistance came with only vague promises and saying that it was impossible for the President to do anything without Congressional approval. Pétain then drew a letter of resignation from his pocket, an act which was certain to bring down the government (he had persuaded Weygand to come to Bordeaux by telling him that 16 June would be the decisive day). Lebrun persuaded him to stay until Churchill’s reply had been received. After lunch, Churchill’s telegram arrived agreeing to an armistice provided the French fleet was moved to British ports, a suggestion which was not acceptable to Darlan, who argued that it would leave France defenceless. That afternoon the British Government offered joint nationality for Frenchmen and Britons in a Franco-British Union. Reynaud and five ministers thought these proposals acceptable. The others did not, seeing the offer as insulting and a device to make France subservient to Great Britain, as a kind of extra Dominion. Contrary to President Albert Lebrun’s later recollection, no formal vote appears to have been taken at Cabinet on 16 June. The outcome of the meeting is uncertain. Ten ministers wanted to fight on and 7 favoured an armistice (but these included the two Deputy Prime Ministers Pétain and Camille Chautemps and this view was also favoured by the Commander-in-Chief General Weygand). Eight were initially undecided but swung towards an armistice. Lebrun reluctantly accepted Reynaud’s resignation as Prime Minister on 16 June and felt he had little choice but to appoint Pétain in his place. 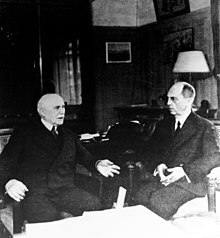 Pétain already had a ministerial team ready: Laval for Foreign Affairs (this appointment was briefly vetoed by Weygand), Weygand as Minister of Defence, Darlan as Minister for the Navy and Bouthillier for Finance. Pétain meeting Hitler at Montoire on 24 October 1940; Joachim von Ribbentrop on the right, Hitler's interpreter, Paul Schmidt in the centre. The personal emblem of Philippe Pétain was a stylised francisca, which was featured on an order of merit and was used as Vichy France's informal emblem. A new Cabinet with Pétain as head of government was formed, with Henry du Moulin de Labarthète as the Cabinet Secretary. At midnight on 15 June 1940, Baudouin was asking the Spanish Ambassador to submit to Germany a request to cease hostilities at once and for Germany to make known its peace terms. At 12:30 am, Pétain made his first broadcast to the French people. Cabinet and Parliament still argued between themselves on the question of whether or not to retreat to North Africa. On 18 June, Édouard Herriot (who would later be a prosecution witness at Pétain's trial) and Jeanneney, the presidents of the two Chambers of Parliament, as well as Lebrun said they wanted to go. Pétain said he was not departing. On the 20th, a delegation from the two chambers came to Pétain to protest at the proposed departure of President Lebrun. The next day, they went to Lebrun himself. In the event, only 26 deputies and 1 senator headed for Africa, amongst them those with Jewish backgrounds, Georges Mandel, Pierre Mendès France, and the former Popular Front Education Minister, Jean Zay. Pétain broadcast again to the French people on that day. On 22 June, France signed an armistice at Compiègne with Germany that gave Germany control over the north and west of the country, including Paris and all of the Atlantic coastline, but left the rest, around two-fifths of France's prewar territory, unoccupied. Paris remained the de jure capital. On 29 June, the French Government moved to Clermont-Ferrand where the first discussions of constitutional changes were mooted, with Pierre Laval having personal discussions with President Lebrun, who had, in the event, not departed France. On 1 July, the government, finding Clermont too cramped, moved to Vichy, at Baudouin's suggestion, the empty hotels there being more suitable for the government ministries. Pétain was reactionary by temperament and education, and quickly began blaming the Third Republic and its endemic corruption for the French defeat. His regime soon took on clear authoritarian—and in some cases, fascist—characteristics. 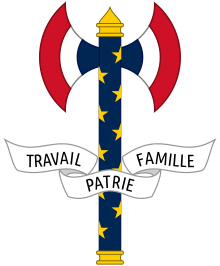 The republican motto of "Liberté, égalité, fraternité" was replaced with "Travail, famille, patrie" ("Work, family, fatherland"). He issued new constitutional acts which abolished the presidency, indefinitely adjourned parliament, and also gave him full power to appoint and fire ministers and civil service members, pass laws through the Council of Ministers and designate a successor (he chose Laval). Though Pétain publicly stated that he had no desire to become "a Caesar," by January 1941 Pétain held virtually all governing power in France; nearly all legislative, executive, and judicial powers were either de jure or de facto in his hands. One of his advisors commented that he had more power than any French leader since Louis XIV. Fascistic and revolutionary conservative factions within the new government used the opportunity to launch an ambitious programme known as the "National Revolution", which rejected much of the former Third Republic's secular and liberal traditions in favour of an authoritarian, paternalist, Catholic society. Pétain, amongst others, took exception to the use of the inflammatory term "revolution" to describe an essentially conservative movement, but otherwise participated in the transformation of French society from "Republic" to "State." He added that the new France would be "a social hierarchy... rejecting the false idea of the natural equality of men." The new government immediately used its new powers to order harsh measures, including the dismissal of republican civil servants, the installation of exceptional jurisdictions, the proclamation of antisemitic laws, and the imprisonment of opponents and foreign refugees. Censorship was imposed, and freedom of expression and thought were effectively abolished with the reinstatement of the crime of "felony of opinion." The regime organised a "Légion Française des Combattants," which included "Friends of the Legion" and "Cadets of the Legion", groups of those who had never fought but were politically attached to the new regime. Pétain championed a rural, Catholic France that spurned internationalism. As a retired military commander, he ran the country on military lines. He and his government collaborated with Germany and even produced a legion of volunteers to fight in Russia. Pétain's government was nevertheless internationally recognised, notably by the U.S., at least until the German occupation of the rest of France. Neither Pétain nor his successive deputies, Laval, Pierre-Étienne Flandin, or Admiral François Darlan, gave significant resistance to requests by the Germans to indirectly aid the Axis Powers. However, when Hitler met Pétain at Montoire in October 1940 to discuss the French government's role in the new European Order, the Marshal "listened to Hitler in silence. Not once did he offer a sympathetic word for Germany." Still, the handshake he offered to Hitler caused much uproar in London, and probably influenced Britain's decision to lend the Free French naval support for their operations at Gabon. Furthermore, France even remained formally at war with Germany, albeit opposed to the Free French. Following the British attacks of July and September 1940 (Mers el Kébir, Dakar), the French government became increasingly fearful of the British and took the initiative to collaborate with the occupiers. Pétain accepted the government's creation of a collaborationist armed militia (the Milice) under the command of Joseph Darnand, who, along with German forces, led a campaign of repression against the French resistance ("Maquis"). Pétain admitted Darnand into his government as Secretary of the Maintenance of Public Order (Secrétaire d'État au Maintien de l'Ordre). In August 1944, Pétain made an attempt to distance himself from the crimes of the militia by writing Darnand a letter of reprimand for the organisation's "excesses". The latter wrote a sarcastic reply, telling Pétain that he should have "thought of this before". Pétain's government acquiesced to the Axis forces demands for large supplies of manufactured goods and foodstuffs, and also ordered French troops in France's colonial empire (in Dakar, Syria, Madagascar, Oran and Morocco) to defend sovereign French territory against any aggressors, Allied or otherwise. Pétain's motives are a topic of wide conjecture. Winston Churchill had spoken to Reynaud during the impending fall of France, saying of Pétain, "... he had always been a defeatist, even in the last war [World War I]." On 11 November 1942, German forces invaded the unoccupied zone of Southern France in response to the Allies' Operation Torch landings in North Africa and Admiral François Darlan's agreement to support the Allies. Although the French government nominally remained in existence, civilian administration of almost all France being under it, Pétain became nothing more than a figurehead, as the Germans had negated the pretence of an "independent" government at Vichy. Pétain however remained popular and engaged in a series of visits around France as late as 1944, when he arrived in Paris on 28 April in what Nazi propaganda newsreels described as a "historic" moment for the city. Vast crowds cheered him in front of the Hôtel de Ville and in the streets. Following the liberation of France, on 7 September 1944 Pétain and other members of the French cabinet at Vichy were relocated by the Germans to the Sigmaringen enclave in Germany, where they became a government-in-exile until April 1945. Pétain, however, having been forced to leave France, refused to participate in this government and Fernand de Brinon now headed the 'government commission.' In a note dated 29 October 1944, Pétain forbade de Brinon to use the Marshal's name in any connection with this new government, and on 5 April 1945, Pétain wrote a note to Hitler expressing his wish to return to France. No reply ever came. However, on his birthday almost three weeks later, he was taken to the Swiss border. Two days later he crossed the French frontier. De Gaulle later wrote that Pétain's decision to return to France to face his accusers in person was "certainly courageous". The provisional government headed by De Gaulle placed Pétain on trial, which took place from 23 July to 15 August 1945, for treason. Dressed in the uniform of a Marshal of France, Pétain remained silent through most of the proceedings after an initial statement that denied the right of the High Court, as constituted, to try him. De Gaulle himself later criticised the trial, stating, "Too often, the discussions took on the appearance of a partisan trial, sometimes even a settling of accounts, when the whole affair should have been treated only from the standpoint of national defence and independence." At the end of Pétain's trial, he was convicted on all charges. The jury sentenced him to death by a one-vote majority. Due to his advanced age, the Court asked that the sentence not be carried out. De Gaulle, who was President of the Provisional Government of the French Republic at the end of the war, commuted the sentence to life imprisonment due to Pétain's age and his military contributions in World War I. After his conviction, the Court stripped Pétain of all military ranks and honours save for the one distinction of Marshal of France. Fearing riots at the announcement of the sentence, De Gaulle ordered that Pétain be immediately transported on the former's private aircraft to Fort du Portalet in the Pyrenees, where he remained from 15 August to 16 November 1945. The government later transferred him to the Fort de Pierre-Levée citadel on the Île d'Yeu, a small island off the French Atlantic coast. Over the following years Pétain's lawyers and many foreign governments and dignitaries, including Queen Mary and the Duke of Windsor, appealed to successive French governments for Pétain's release, but given the unstable state of Fourth Republic politics no government was willing to risk unpopularity by releasing him. As early as June 1946 U.S. President Harry Truman interceded in vain for his release, even offering to provide political asylum in the U.S. A similar offer was later made by the Spanish dictator General Franco. On 8 June 1951 President Auriol, informed that Pétain had little longer to live, commuted his sentence to confinement in hospital (the news was kept secret until after the elections on 17 June), but by then Pétain was too ill to be moved to Paris. He died in a private home in Port-Joinville on the Île d'Yeu on 23 July 1951, at the age of 95, and was buried in a local cemetery (Cimetière communal de Port-Joinville). Calls are sometimes made to re-inter his remains in the grave prepared for him in Verdun. His sometime protégé Charles de Gaulle later wrote that Pétain’s life was "successively banal, then glorious, then deplorable, but never mediocre". In February 1973, Pétain's coffin was stolen from the Île d'Yeu cemetery by extremists who demanded that President Georges Pompidou consent to his interment in the Douaumont cemetery among the war dead. Authorities retrieved the coffin a few days later, and Pétain was ceremoniously reburied with a Presidential wreath on his coffin, but in the Île d'Yeu as before. On 26 October 1931 Pétain was honored with a ticker-tape parade down Manhattan's Canyon of Heroes. Consideration has been given to removing the sidewalk ribbon denoting the parade for Pétain given his role with the Nazis in World War II. 23 June 1940 – Adrien Marquet and Pierre Laval enter the Cabinet as Ministers of State. 27 June 1940 – Adrien Marquet succeeds Pomaret as Minister of the Interior. André Février succeeds Frossard as Minister of Transmissions. Frossard remains Minister of Public Works. Charles Pomaret succeeds Février as Minister of Labour. 28 October 1940 – Pierre Laval succeeds Baudouin as Minister of Foreign Affairs. 2 January 1941 – Paul Baudouin ceases to be Minister of Information, and the office is abolished. 27 January 1941 – Joseph Barthélemy succeeds Alibert as Minister of Justice. 18 July 1941 – Pierre Pucheu succeeds Darlan as Minister of the Interior. Darlan retains his other posts. François Lehideux succeeds Pucheu as Minister of Industrial Production. ^ Williams, Charles, Pétain, London, 2005, p. 206, ISBN 978-0-316-86127-4. ^ Verdun 1916, by Malcolm Brown, Tempus Publishing Ltd., Stroud, UK, p. 86. ^ a b Williams 2005, p. 523. ^ Nicola Barber (2003). World War I: The Western Front. Black Rabbit Books. p. 53. ^ Bentley B. Gilbert, and Paul P. Bernard, "The French Army Mutinies of 1917," Historian (1959) 22#1, pp. 24-41. ^ Farrar-Hockley 1975, pp. 301–2. ^ Tucker, S. C. (2009) A Global Chronology of Conflict: From the Ancient World to the Modern Middle East: From the Ancient World to the Modern Middle East, ABC-CLIO, California, p. 1738. ^ Williams, 2005, p. 204. ^ Williams, 2005, p. 212. ^ Atkin, 1997, p. 41. ^ Williams, 2005, p. 217. ^ Williams, 2005, pp. 217–9. ^ Williams, 2005, p. 219. ^ Williams, 2005. p. 232. ^ Williams, 2005, pp. 233–5. ^ Williams, 2005, p. 244. ^ Williams, 2005, p. 247. ^ Williams, 2005, pp. 250–2. ^ Williams, 2005, pp. 253–4. ^ Williams, 2005, p. 257. ^ Williams, 2005, pp. 260–1, 265. ^ Williams, 2005, p. 266. ^ a b Paxton, Robert O. (1982). Vichy France: Old Guard and New Order, 1940–1944, pp. 36–37. Columbia University Press. ISBN 0-231-12469-4. ^ Williams, 2005, pp. 268–9. ^ a b c Jackson, Julian (2001). France: The Dark Years, 1940–1944. Oxford University Press. pp. 124–125, 133. ISBN 0-19-820706-9. ^ Philippe Pétain, "La securité de la France aux cours des années creuses", Revue des deux mondes, 26, 1935. ^ Anthony Adamthwaite, Grandeur and Misery: France's Bid for Power in Europe 1914-1940 (London: Arnold, 1995), p. 182. ^ "Petain appointed envoy to Burgos". New York Times. 3 March 1939. Retrieved 5 April 2019. ^ Griffiths, Richard, Marshal Pétain, Constable, London, 1970, p. 231, ISBN 0-09-455740-3. ^ « Cachet de la sous-préfecture de Dinan, 6 décembre 1943, État français (Régime de Vichy) » Archived 20 July 2011 at the Wayback Machine, Académie de Rennes. ^ Jérôme Cotillon, Un homme d’influence à Vichy : Henry du Moulin de Labarthète, Revue Historique, 2002, issue 622, pp. 353–385. ^ Webster, Paul, Pétain's Crime, Pan Macmillan, London, 1990, p. 40, ISBN 0-333-57301-3. ^ Griffiths, 1970, p. 248. ^ Shields, James (2007). The Extreme Right in France: From Pétain to Le Pen, pp. 15–17. Routledge. ISBN 0-415-09755-X. ^ 'Not a Caesar,' Petain asserts. Associated Press, 1945-06-16. ^ Mark Mazower: Dark Continent (p. 73), Penguin books, ISBN 0-14-024159-0. ^ Jennings, Eric T. French of Africa in World War II p. 44. ^ Churchill, Winston S. The Second World War, Vol 2., p. 159. ^ Pétain et la fin de la collaboration: Sigmaringen, 1944–1945, Henry Rousso, éditions Complexe, Paris, 1984. ^ Griffiths, 1970, pp. 333–34. ^ Williams, 2005, p. 486. ^ Charles De Gaulle, Mémoires de guerre, vol. 2, pp. 249–50. ^ Williams, 2005, pp. 512–13. ^ a b Association Pour Défendre la Mémoire du Maréchal Pétain (A.D.M.P.) (2009). "The World's Oldest Prisoner". Marechal-petain.com. Retrieved 21 November 2011. ^ a b Williams 2005, p. 520. ^ Williams 2005, pp. 527–528. ^ Williams 2005, pp. 528–529. ^ Williams 2005, p. 530. ^ Dank, Milton. The French Against the French: Collaboration and Resistance, p. 361. ^ Conan, Eric; Rousso, Henry (1998). Vichy: An Ever-present Past. Hanover, NH: University Press of New England. p. 21. ISBN 9780874517958. ^ "Pétain, Mount". BC Geographical Names. Szaluta, Jacques. "Marshal Pétain and French nationalism: The interwar years and Vichy." History of European Ideas 15.1-3 (1992): 113-118. Vinen, Richard. Vichy Pétain's Hollow Crown" History Today (1990) 40#6 pp 13-19. online. Williams, Charles. Petain: how the hero of France became a convicted traitor and changed the course of history (Palgrave Macmillan, 2005). Wikimedia Commons has media related to Philippe Pétain. Maxime Weygand was a French military commander in World War I and World War II. The Attack on Mers-el-Kébir also known as the Battle of Mers-el-Kébir, was part of Operation Catapult. The operation was a British naval attack on French Navy ships at the base at Mers El Kébir on the coast of French Algeria. The bombardment killed 1,297 French servicemen, sank a battleship and damaged five ships, for a British loss of five aircraft shot down and two crewmen killed. Major-General Sir Edward Louis Spears, 1st Baronet, was a British Army officer and Member of Parliament noted for his role as a liaison officer between British and French forces in two world wars. Spears was a retired Brigadier General of the British Army, and served as a Member of the British House of Commons. From 1917-1920 he was head of the British Military Mission in Paris. Counter-admiral Gabriel Paul Auphan was a French naval officer who became the State Secretary of the Navy(secrétaire d'État à la Marine) of the Vichy government from April to November 1942. Charles Huntziger was a French Army general during World War I and World War II. He was born at Lesneven (Finistère) of a family of German descent. He graduated from Saint-Cyr in 1900 and joined the colonial infantry. During World War I, he served in the Middle Eastern theatre. He was chief of staff of operations of the Allied Expeditionary Force. In 1918, he participated in the development of General Louis Franchet d'Espèrey's Vardar Offensive against German and Bulgarian forces which would lead to Allied victory and the signing of the Armistice of Mudros in October 1918. Charles Reibel was a French lawyer and politician who was a deputy from 1919 to 1935 and senator from 1936 to 1944. He was Minister of the Liberated Regions from 1922 to 1924, responsible for efforts to restore the area of northern France that had been devastated by the trench warfare of World War I (1914–18). He was against appeasement of Germany before the start of World War II (1939–45) and in favor of stronger defenses and greater armament. However, after the collapse of resistance when Germany invaded France in 1940 he became convinced of the necessity for an armistice to prevent France from again being devastated, and supported the formation of the Vichy government under Marshal Philippe Pétain. Charles Noguès was a French general. He graduated from the École Polytechnique, and he was awarded the Grand Croix of the Legion of Honour in 1939.